Dean’s Blue Hole on Long Island, Bahamas is the world’s deepest blue hole. What are the problems of setting up a Bahamas company? A Bahamas company is seen as an offshore tax haven. How difficult is it to open a corporate bank account for a Bahamas business? It is easy to open a corporate bank account with a reputable international bank in the Bahamas. Am I required to visit Bahamas to incorporate a company there? No. Healy Consultants can legally incorporate your Bahamas company without you needing to travel. 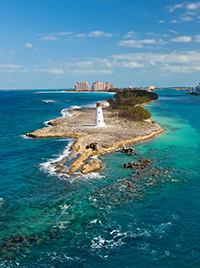 In order to form an IBC in Bahamas company, a minimum of one director is required, who need not by resident. A registered agent is required. Foreigners can own 100% of a non-resident company (one not trading within the Bahamas). Foreign ownership is also permitted for resident companies except for a small number of business sectors. A Bahamas local domestic company (LDC) requires a minimum of two shareholders while an international business company (IBC) requires a minimum of one. No, shareholder and director details are not available for public viewing. A Bahamas company does not require a minimum share. Is a Bahamas company required to submit an annual return and/or financial statements? A Bahamas business is not obliged to submit an annual return and/or financial statements, unless specified in the articles of association.